Cars were heard exploding “every few seconds” and horses stabled on the ground floor for a nearby show were lead to safety. 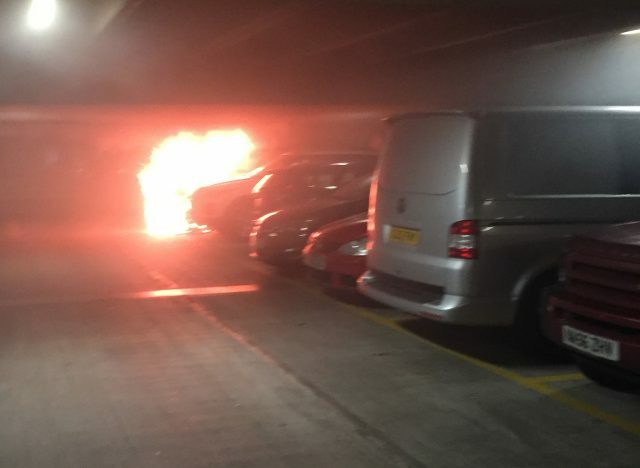 A 1,000C inferno that incinerated up to 1,600 vehicles in a Liverpool car park could have been stopped if sprinklers had been fitted in the building, a chief fire officer said. 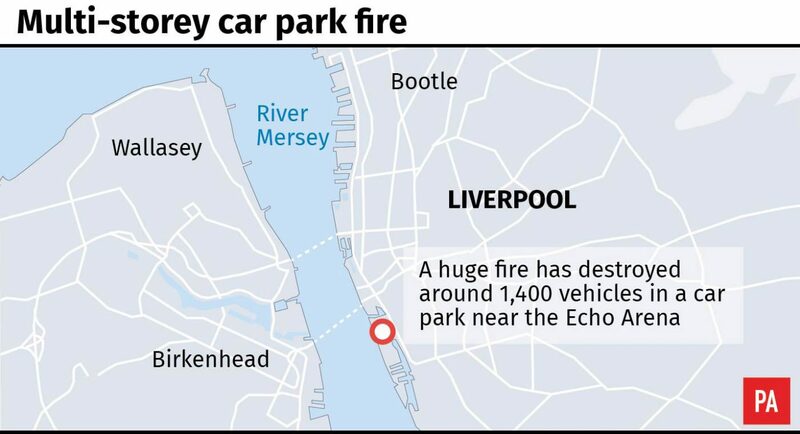 Dan Stephens, of Merseyside Fire and Rescue Service (MFRS), said such a system would have given crews a “much better” chance of stopping the fire, which went on to engulf seven floors of the multi-storey car park at the Echo Arena on Liverpool’s waterfront after a Land Rover burst into flames. Joe Anderson, the Mayor of Liverpool, said the council will take advice on any “lessons to be learned” over the blaze at the local authority-owned building, which was constructed in 2008. Motorists abandoned their cars and fled along with 4,000 people who were evacuated as the final event of the Liverpool International Horse Show was called off at the Echo Arena. Residents living in apartments nearby and tourists staying in hotels were also forced to leave as 12 fire engines and aerial ladders were scrambled to the scene at around 4.42pm on New Year’s Eve. Former Liverpool and England international footballer Mark Wright and his wife, Sue, who were visiting the horse show, were forced to abandon their vehicle and fled along with six children who were with them as they dialled 999 for help. Mrs Wright helped ensure 80 horses being stabled on the ground floor of the car park were led to safety. The couple, along with others at the scene, questioned how the fire was able spread so quickly. Mr Stephens, speaking from the scene, said the temperature of the fire was between 800C and 1,000C, and although crews attended within eight minutes of the alarm, the flames spread so quickly they were not able to control the blaze. He said: “One thing is for certain – had the building been sprinklered there is every chance that would have suppressed the fire sufficiently then for us to be able to go in and extinguish the fire without it spreading in the way that it did. “I believe a sprinkler system would certainly have suppressed the fire, it would definitely have limited the spread and given us a much better opportunity to put the fire out before it spread to the extent it did. Mayor of Liverpool Joe Anderson said: “If the chief fire officer or anybody else wants to make that comment we will listen to it and look at what we can do. “Bottom line is, this is something we will look at – we will take his advice and other people’s advice, and if there’s things we can do to make the car parks more safer then that is exactly what we will do. We won’t bury our heads in the sand. I have heard conflicting advice. “We will listen, we’ll take advice from the chief fire officer, we’ll look at what we do with this car park and what we do with our car parks if the advice is we should have sprinkler systems. 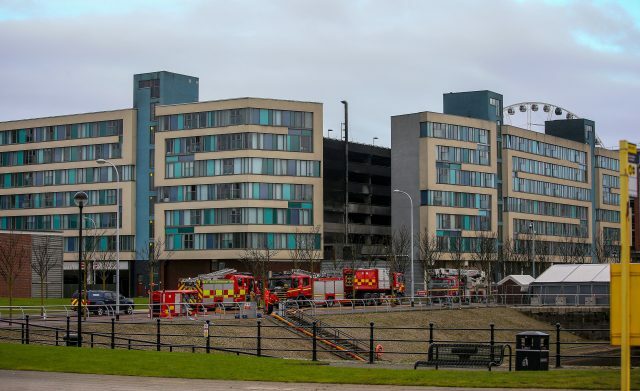 Fire crews were able to protect apartments on two sides of the car park, the hotels and the Arena building, as well as assisting with the evacuation of the horses. Two dogs were also rescued from cars on the second floor, and this morning four more dogs were rescued from cars on the seventh floor.